Going to the Galapagos is an expensive business and this tends to put many inderpendent travellers off going there, which is a great pity as it’s a fantastic place. There are ways to get around the expense and have a great time, this is how we did it. Getting there, flying is really the only option. All Foreigners are charged the same return fare, just short of $400. In addition you have to pay a park entrance fee of $100 in cash as soon as you get off the plane, so you have paid out $500 and you’re still at the Airport. This is the ‘standard charge’ which everyone has to pay, whether they are going on a luxury cruise or doing everything themselves. My point of view is that if you are going to shell out all that money just to get there, you may as well as spend some time on the island. I was amazed when I met people in Quito who had just been there, taken a four (two) day tour and then flown back to the mainland, having now ‘done’ the Galapagos. If you on a two week holiday you will have to do it this way, but if you have time, take your time. We went to the Galapagos without booking a tour but fully expecting to go around the agencies in Pto Ayora and booking one there. We had plenty of time (almost three weeks) so were prepared to be very flexible and we allocated a budget of $1000 to cover tour expenses and were looking for a tourist superior boat. It became clear after a few agencies and some detailed questioning, that most of the tours were not what they seemed. We were looking for a four-day tour, but in fact what you get is a two and a half day tour. The first day usually begins in the afternoon with either a meal on the boat in the evening and the boat then sailing, or a trip to the Charles Darwin center in Pto Ayora (which is 10 minutes walk away and is free) and then getting on the boat. The next two days is spent cruising around the islands and island visits. On the fourth day you visit an island (usually North Seymour) at the crack of dawn and are then left at the Airport on Baltra by 0930, and that’s you trip done. For this expect to pay $350. So we decided to do everything ourselves. We did two day trips, one from Pto Ayora and one from Pto Baquerizo Moreno (PBM). The first day trip was to Plaza Sur and included some snorkeling and cost $65 and which considering the number of animals we saw outstanding value. The boat was also very good with a fresh cooked lunch provided on board. We booked this through ‘Live the Dream’, this was the only agency in Pto Ayora that made any effort to meet our needs. With the rest it was all, this is what we have take it or leave it. The trip we booked in PBM was also good value, a trip out to Kicker Rock to snorkel (where we swam with sharks) and snorkeling at Isla Lobos; we could not land there, as we did not have a Park Guide with us. This trip cost $40 each. As well as being better value, if you are not a good sailor, day trips make a lot more sense. The problems with Day trips is you have to be flexible. Trips to certain islands only go on certain days of the week and if you want to a particular island and the boat in going next Friday, you will have to wait until then. Often the day trips are booked up by tour groups (we went to Plaza Sur with a group of elderly Germans off a cruise ship) and they will only have a few places for independent travelers, so make sure you go to an agency who will pick up the phone and ring the various boats to find the spaces. You may have to wait a while if you want to go to a particular place. In San Cristobal it is much easier as the local agencies, which are usually Dive shops run the tours themselves, so they will go to a particular place if they can get enough people. If it’s possible, and I don’t know if it is, try and book the Day trips in Quito. You can see a lot in 5 – 6 days, especially if you move between the islands. It’s not all wildlife either, there are great beaches, diving is great if you are into it and there is a small community of surfers on San Cristobal. A comment on the Animals. What was a real surprise is how they seemed to be everywhere and how tame they were. After a few days, seeing Iguanas and Sea Lions will seem normal as very often you can see them just walking down the street in places like Pto Ayora. We are interested in Natural History and had bought the Michael H.Jackson guide with us. We managed to see almost everything that we wanted to see, with some ‘extras’ like Minke Whales and Dolphins. You don’t need an elaborate tour or a qualified guide to see the wildlife; it’s all around you if you look for it. Some notes on the main islands and places. Pto Ayora and Isla Santa Cruz. We stayed at Hotel España, which had large, clean rooms and a nice sitting out area. There is also the use of a kitchen. Price $10 p.p.p night. The best places to eat are on Charles Binford, great ceviche at good prices. If you want to go up to the Highlands, just get the local bus and get out when you want to. The two large sinkholes at the top of the Highlands are worth looking at. Then just hitch a lift on a collectivo back to town. Isla Isabela. We went here on the inter island motorboat (a Fibra) which goes once a day from the jetty at Pto Ayora. Always buy boat tickets the day before (cost $30 pp) at the jetty, not from an agency, as they will charge you an extra $5 for the privilege. We spent six days on Isabela which is great place, very quiet and laid back with lovely beaches which you will share only with the massive Marine Iguanas, animals everywhere and well marked trails to take you to some lovely places. We also did a trip on horseback up to Sierra Negra, which is very worthwhile. We did it ourselves but it a lot easier to go on a tour as you have to have a guide to get close to the mountain, and there is a police post to make sure you have one. Another worthwhile trip is to the Los Tiburones, a small group of islands (the largest one has a trail on it) which is just outside the port. Lots to see here and you can get very close the animals; we saw penguins here amongst other things. Go in the mornings if you want to see the white tipped sharks. Just go down to the jetty and negotiate with a water taxi, it should cost about $10 - $15 for the trip. We stayed at the Hostel Flamencos, next to the Flamingo pool. Big, clean rooms with either fan or aircon. Price $10 pp. Avoid the Hotel San Vincente as they cater for the small tour group market to the island, so they give independent travelers the duff rooms. We took the Fibra back to Santa Cruz then after a day or so took another one to San Cristobal. Again there is a lot to see around the main town. Good trails head out from the interpretive centre, and there is a nice swimming beach close to it. Again we went into the interior to the Crater Lake, El Junco. Just negotiate with a cab, then hitch a collectivo back. We stayed in the Hotel San Francisco on the ‘front’ at PBM (with earshot of the sea lion colony). The rooms at the front are good, prices from $5 to $8 pp. Flying with TAME ALWAYS confirm the flight back. We did this at their office in PMB to discover that we were no longer on the passenger list. Luckily the helpful guy there sorted it all out. Even though the plane leaves at 1245, the check in opens at 0900, and the locals start queuing before that. It seems that the flights are often overbooked and those who get there first get the seats. We got there at 0800 and were first in the queue. Once you’ve checked in you can go back to town for breakfast. There are two airports in Galapagos that handle flights to the mainland, one on Baltra and the other on San Cristobal. You can fly into one and fly out of the other with no problems or surcharge, which is what we did. Just arrange it when you book the ticket. You can also have an open ticket where you can book the return flight while you are there but after our experiences with Tame I wouldn’t advise it. In total our extra travel expenses for the Galapagos, including all boat trips, horse hire and day trips came to $490 for both of us; we don’t think there was much that we missed much at least as seeing endemic animals is concerned and we probably saw as much or more than the people who do longer tours. So we were very satisfied that we used our time and money in the Galapagos to our best advantage. We were surprised by the number of people we met who seemed to be in the Galapagos just to ‘tick the box’, and who didn’t really have any idea of what there was to see there or why the place the unique. We heard loads of conversations on how much each tour cost and where everyone went, but not a word about the animals they went there to see. The Galapagos is a wonderful place and totally unique, if you love nature you will have a great time. 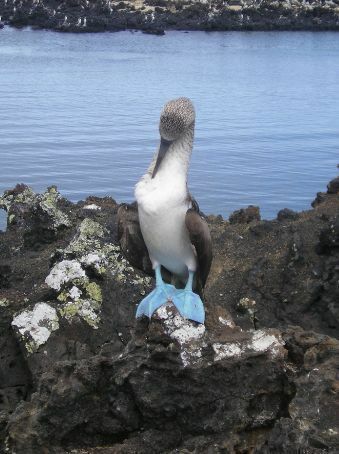 This article was orginally posted on Lonely Planets Thorn Tree site and has drawn a big response including updates from travellers who have followed our advice and seen the Galapagos inderpendently. To see the Thread click on this link. i came to your site from thron tree where i expected more diy advice on the galapogos but it seems that not many people do it the chep way. as someone who only ever books a fight and one night in a hostel if the fights late the idea of having to book up before i went was really bugging me. but this is to be our honeymoon (one month in the gappos) so i didn't want to mess up. we have nine days to kill from quito to lima do you suggest anywhere that would be good to visit as we dont want to spend all that time in quito? maybe somewhere with a beach would be good. thanks. I was just thinking about The Galapagos for Inderpendent Travellers and you've really helped out. Thanks! Thanks for the info.. I´ll point people here in Quito who are looking for info on how to do it indendantly to the article.. If anyone is going and would be up for sending me a post card from Floreana to be picked up and delivered by other travellers, check out all the information on my blog.. Just found out about the tradition and want to see it kept up! This was a great read :) I'm heading to the Galapagos Islands in late January, and I was wondering what you think of the student tour from Sharksky (http://www.sharksky.com/ingles/volunteering.html) at $575? Unfortunately I'm only there for 5 days, which is really not enough for that beautiful part of the world, but alas that's all I have. Would you be able to give me some quick advice if I should go with this tour or not, as I really have no time to go hunting for tours or guides when I get there. Looking at the details on Sharkskys website it does look like a good deal, almost too good; I can’t imagine that the food and accommodation will be of a very high standard but it will allow you to see quite a few islands. I note that they mention activities and having fun but the animals don’t get a look in, I would suggest you take a good guide book as you are unlikely to get much information about what you are looking at. Don’t forget that you’ll have to pay another $500 for the flights and park fees. Thanks Will for the quick reponse :) Yes the $100 park fee is mentioned everywhere on every site I look at, so I don't think anyone would miss that. I've been in constant email contact with one of the managers of that particular company, and she informed me that part of the deal Galapagos Islands did with LAN airlines, is they have to open a route from the mainland to San Cristobal island before the end of the year, which helps :) But yeah overall it'll still be about $450 odd. I've also been in email contact with other travellers who've stayed in some of the accommodation Sharksky have listed, and so far no alarm bells are ringing. I am only there for five days after all lol, but I will make note of the places you mentioned too. I'll definitely be keeping an eye out for the wildlife. I've been reading up on it, and will take a guide book definitely :) Since you have a lot of experience travelling, do you have any advice on what sort of backpack I should have for a 10 week jaunt around Central/South America? I've travelled overseas a few times before, but never on a solo backpacking trip. Great information mate, thanks alot, as you say the boats seem all about being able to say where you have and haven't been, rather than the quality of what you're actually seeing.